The Shun Hinoki cutting board is the perfect lightweight wooden cutting surface for extending the edge life of your Shun cutlery. Made out of Hinoki wood, a white cypress wood, this cutting board is easy on knives and less susceptible to cuts and damage from chopping thanks to the wood's medium-soft grain. It also has natural antibacterial qualities that make it perfect for cutting food in any kitchen. 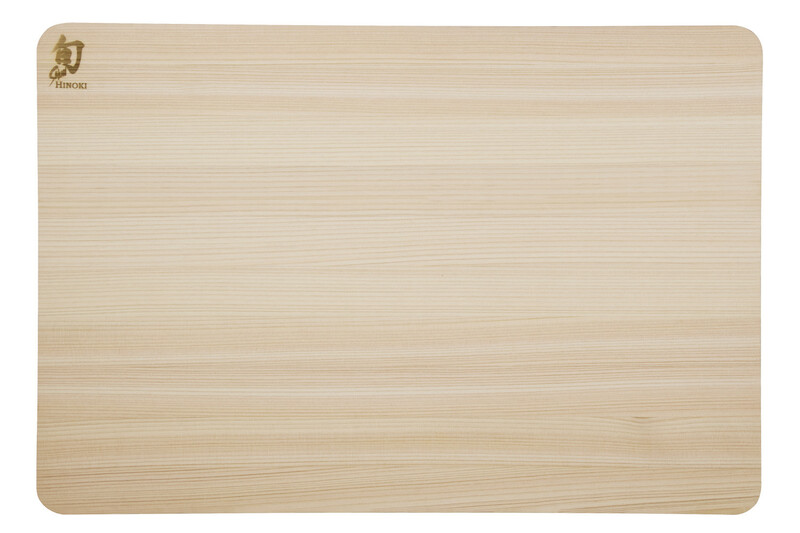 Made in Japan, this Hinoki cutting board from Shun has a natural lemon scent as well as a beautiful wood profile. It comes with a 10-year warranty from Shun. Hinoki wood is naturally antibacterial. Medium-soft wood and grain preserves blade edge of all knives. Sealed edges limit water absorption when washing. Hand wash only, using mild detergent and warm water. Towel dry, and then allow board to air-dry away from direct sunlight.